The seventies trend first reared its rather stylish head last season, when we saw the revival of camel, fur and flares (for some fantastic seventies inspiration, view our previous post), and it's definitely not going anywhere for a while yet! Paying homage to the look of 40 years ago, we've launched our collection - 70s Chic! Our favourite pieces of the collection? Hmmm, that's a toughie! 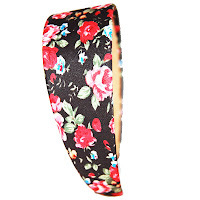 We suppose, if we are compiling a hit-list, then this Black Floral Hairband would HAVE to be on it. A gorgeous, boho-esque, wide band design with red and pink rose pattern, this accessory is perfectly in-keeping with the era, and priced at only £7 is a fantastic way to give your outfit a nod to the seventies. The colour of this Crystal Stud Cuff says it all. 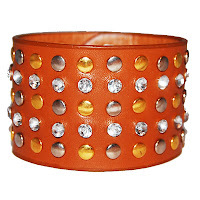 Tan browns are so hot right now and so are faux leather cuffs. We particularly liked this one because of its crystal and stud detailing. Priced at £9, it's a brilliant statement piece. 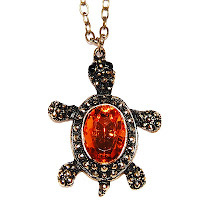 We love this Amber Stone Turtle Necklace! It's not only the amber stone and antique gold capturing the seventies that drew us to this piece, but also the turtle, which adds that quirky edge (a characteristic we ADORE in fashion jewellery!). This long length pendant sits beautifully with a sheer blouse and flares (for extra seventies appeal), and priced at £13, we're sure it'll prove an investment piece for the season. We've saved the best 'til very last, though. 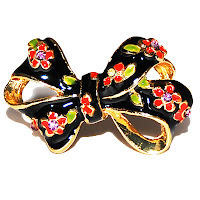 A definite favourite of the collection and, dare we say, a favourite of all the Chelsea Doll pieces, is this Black Floral Bow Ring. We're loving bows this season, so pretty and delicate. This bow is decorated with beautiful enamel red and green flowers, centred with crystals. Priced at £8, it's hard to resist such a wonderfully pretty piece of finger candy!